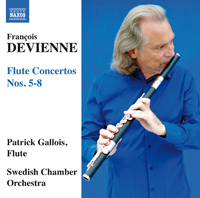 FRANÇOIS DEVIENNE (1759-1803): Flute Concertos, Vol. 2 - No. 5 in G, No. 6 in D, No. 7 in E Minor and No. 8 in G.
Description: Concertos by the "French Mozart", who may have died in the infamous lunatic asylum at Charenton but who also wrote a hell of a lot of very attractive, Mozartian music in his fairly short career. Swedish Chamber Orchestra; Patrick Gallois (flute).